Oil on canvas, 47 x 37 cm. La Scala Santa, the holy staircase, was built in the 1100s on the slope near Monte Taleo in order to create a link between two holy places that were previously only connected by a narrow path. The stairs were later integrated into the large Benedictine monastery complex San Benedetto with both upper and lower church rooms and several chapels. The frescoes on the walls were carried out in the 1300s. It would have been a cool and comfortable place to rest in the hottest hours of the day and Roed spent entire days in the beautiful rooms, where he painted scenes such as this one. 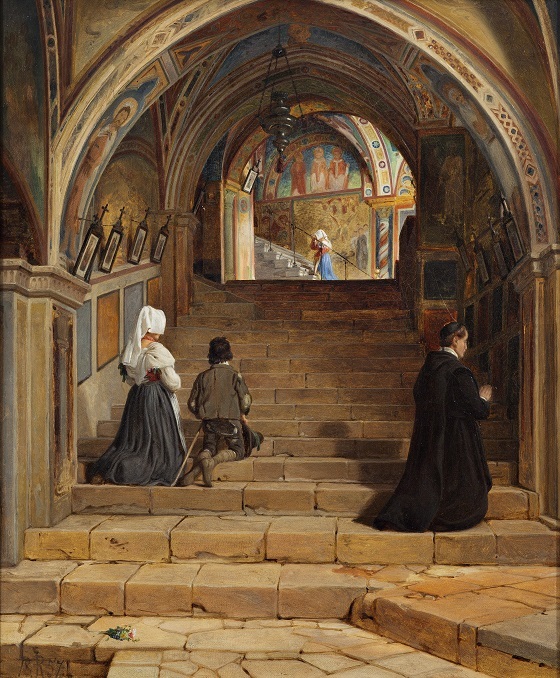 The rendering of the architecture and the few figures that populate the stairs is objectively observed and the composition is dynamic. One’s gaze is led through a series of frescoed vaults opening up into the lower church, from where a staircase continues into the upper one. The monk and the three churchgoers serve to give the architecture a human dimension, as well as to tie together the rhythmic course of the composition. Jørgen Roed joined the Art Academy at the age of fourteen as a student of the portraitist Heinrich Hansen. He later studied under C.W. Eckersberg and for many years, he was interested in architecture painting, which he practiced during his study abroad in Italy in the period 1837-1841. Here, he also carried out many landscapes and received commissions for altarpieces from patrons at home in Denmark. After his return, he supported himself primarily as a portraitist for financial reasons, but it was the earliest paintings that would be of most significance in the future. Roed carried out numerous artist portraits, among others of Wilhelm Marstand and Herman Wilhelm Bissen.